Jian Chen, Haipeng Cai, Alexander P. Auchus, and David H. Laidlaw. Gryphon: A Little Domain-Specific Programming Language for Diffusion MRI Visualizations. In Handbook of Human Centric Visualization, pages 41-61. Springer New York, 2014,. (bibtex: Chen-2014-GLD). Mykhaylo Kostandov, Jian Chen, Igor Pivkin, Daniel K. Riskin, Dave Willis, Sharon Swartz, and David H. Laidlaw. Visual Analysis of Dimensionality Reduction in an Interactive Virtual Environment for Exploring Bat Flight Kinematics. In Proceedings of the Joint Virtual Reality Conference of EGVE-ICAT-EuroVR, 2009. In Press (pdf) (bibtex: Chen-2009-POD). Sidra Islam. Test Paper. In Preceedings of Tests, 2008. (bibtex: Sidra-2008-RVP). Peter Richardson, Igor Pivkin, and George Karniadakis. Red cells in shear flow: Dissipative particle dynamics modeling. Biorheology, 45:107-108, 2008. (bibtex: Richardson-2008-BIO). Glenn R. Luecke, James Coyle, Jim Hoekstra, Marina Kraeva, Ying Li, Olga Taborskaia, and Yanmei Wang. A Survey of Systems for Detecting Serial Run-time Errors. Online publication, 2006. (pdf) (bibtex: Luecke-2006-SSD). Igor Pivkin, Peter Richardson, and George Karniadakis. Blood flow velocity effects and role of activation delay time on growth and form of platelet thrombi. In Proc Nat Acad Sci 103(46):, pages 17164-17169, November 14 2006. (bibtex: Pivkin-2006-CAD). David H. Laidlaw. Moving Research into Practice. Panel Presentation on Homeland Security and Emerging Technology. The Science and Technology Agenda for Visual Analytics: Science and Technology Recommendations, February 2005. (pdf) (bibtex: Laidlaw-2005-MRP). Kelly Gaither, Bill Geisler, David H. Laidlaw, and David Ebert. Panel: In the Eye of the Beholder: The Role of Perception in Scientific Visualization. In Proceedings of IEEE Visualization Conference, pages 567-568, October 10—15 2004. (pdf) (bibtex: Gaither-2004-IEB). Jon Genetti, Mike Bailey, David H. Laidlaw, Robert Moorhead, and Ross Whitaker. What Should We Teach in a Scientific Visualization Class? Panel in IEEE Visualization 2004, October 2004. (bibtex: Genetti-2004-WSW). Andreas Wenger, Daniel Keefe, Song Zhang, and David H. Laidlaw. 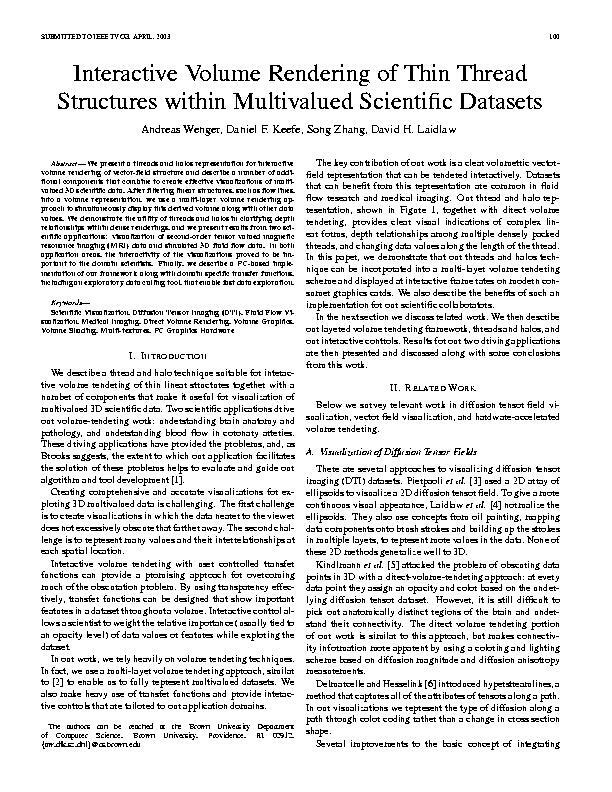 Interactive Volume Rendering of Thin Thread Structures within Multivalued Scientific Datasets. IEEE Transactions on Visualization and Computer Graphics, 10(6):664-672, November/December 2004. (pdf) (bibtex: Wenger-2004-IVR). Song Zhang and David H. Laidlaw. Towards a Global Tractography-based Model of FA. In Workshop on aging connections: Advanded MRI of age related white matter changes in the brain. ISMRM, 2004. (pdf) (bibtex: Zhang-2004-TGT). Brown University. Rhetoric Fellows Handbook, 2003. Unpublished (pdf) (bibtex: Brown-2003-RFH). Robert Kosara, Christopher G. Healey, Victoria Interrante, David H. Laidlaw, and Colin Ware. User Studies: Why, How, and When. Computer Graphics and Applications, 23(4):20-25, July/August 2003. (pdf) (bibtex: Kosara-2003-TUS). G. Elisabeta Marai, David H. Laidlaw, Cagatay Demiralp, Stuart Andrews, Cindy Grimm, and Joseph J. Crisco. Estimating joint contact areas and ligament lengths from bone kinematics and surfaces. 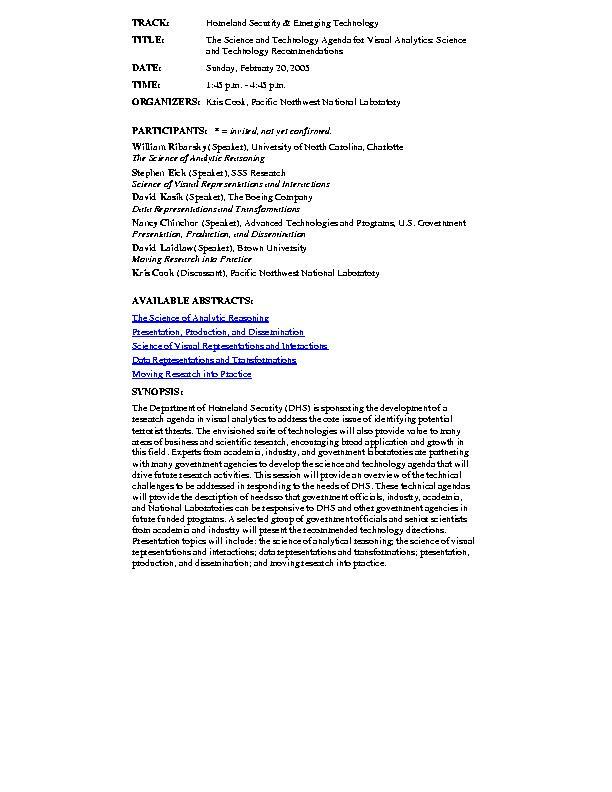 IEEE Transactions on Biomedical Engineering, 51(5):790-799, May 2003. (pdf) (bibtex: Marai-2003-EJC). G. Elisabeta Marai, David H. Laidlaw, James J Coburn, Mohammad A Upal, and Joseph J. Crisco. A 3D Method for Segmenting and Registering Carpal Bones from CT Volume Images. In Proceedings of Annual Meeting of the American Society of Biomechanics, September 2003. (pdf) (ppt) (bibtex: Marai-2003-3DM). CNN. Say Cheese: Robot Photographer is Here. CNN.com Technology, November 2002. (pdf) (bibtex: Cnn-2002-SCR). Marco DaSilva, Song Zhang, Cagatay Demiralp, and David H. Laidlaw. Visualizing the Differences between Diffusion Tensor Volume Images. 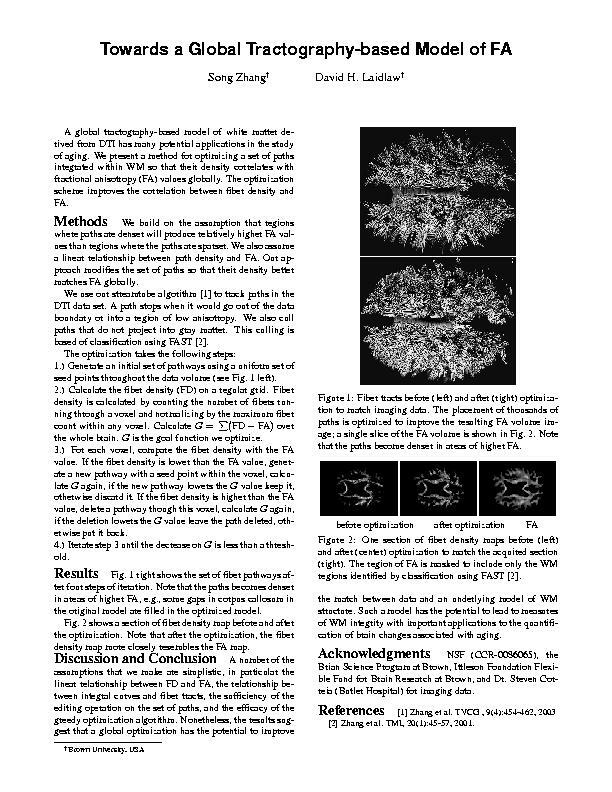 In Proceedings ISMRM Workshop in Diffusion MRI: Biophysical Issues, pages 237-238, March 2002. (pdf) (bibtex: DaSilva-2002-VDD). Janice J. Heiss. The Poetry of Programing. Interview to Richard Gabriel. java.sun.com, December 2002. (pdf) (bibtex: Heiss-2002-TPP). Joe Kniss, Gordon Kindlmann, and Charles Hansen. Multidimensional Transfer Functions for Interactive Volume Rendering. Transactions on Visualization and Computer Graphics, 8(3):270-285, July/September 2002. (pdf) (bibtex: Kniss-2002-MTF). Eric B. Lum, Kwan-Liu Ma, and John Clyne. A Hardware-Assisted Scalable Solution for Interactive Volume Rendering of Time-Varying Data. Transactions on Visualization and Computer Graphics, 8(3):286-301, July/Spetember 2002. (pdf) (bibtex: Lum-2002-AHA). G. Elisabeta Marai, David H. Laidlaw, Cagatay Demiralp, Cindy Grimm, Joseph J. Crisco, Douglas Moore, and E. Akelman. Contact Areas and Ligament Lengths are Abnormal in Patients with Malunited Distal Radius Fracture Despite Normal Radioulnar Kinematics. In World Congress Biomechanics, 2002. (pdf) (bibtex: Marai-2002-CAA). Susumu Mori, Walter E. Kaufmann, Christos Davatzikos, Bram Stieltjes, Laura Amodei, Kim Fredericksen, Godfrey D. Pearlson, Elias R. Melhem, Meiyappan Solaiyappan, Gerald V. Raymond, Hugo W. Moser, and Peter C.M. van Zijl. Imaging Cortical Association Tracts in the Human Brain Using Diffusion-Tensor-Based Axonal Tracking, February 2002. (pdf) (bibtex: Mori-2002-ICT). Good early paper about using characteristics of tracts derived from DTI to quantify among individuals. Michael J. Tarr and William H. Warren. Virtual Reality in Behavioral Neuroscience. Unpublished (pdf) (bibtex: Tarr-2002-VRB), 2002. Dean Turner, Iain Woodhouse, and David H. Laidlaw. A Synoptic Visualization of Fully Polarimetric SAR Data: an Annotated Example. In Proceedings of IEEE IGARSS, 2002. (pdf) (bibtex: Turner-2002-SVF). Kathy Walker. Virtual da Vinci. Shift Magazine, 10(2), May 2002. (pdf) (bibtex: Walker-2002-VDV). Iain Woodhouse, Dean Turner, and David H. Laidlaw. Improving the Visualization of Polarimetric Response in SAR Images: from Pixels to Images. In Proceedings of IEEE IGARSS, 2002. (pdf) (bibtex: Woodhouse-2002-IVP). Joseph J. Crisco, Cagatay Demiralp, David H. Laidlaw, A-P. C. Weiss, E. Akelman, and S.W. Wolfe. Interactive Visualization of 3D Carpal Kinematics and Bony Anatomy. In Am. Soc. for Surgery of the Hand 56th Annual Meeting, October 2001. (bibtex: Crisco-2001-IV3). Marco DaSilva, Song Zhang, Cagatay Demiralp, and David H. Laidlaw. Visualizing Diffusion Tensor Volume Differences. In Visualization '01 Work in Progress Proceedings, pages 16-17, October 2001. (pdf) (bibtex: DaSilva-2001-VDT). Cagatay Demiralp, G. Elisabeta Marai, Stuart Andrews, David H. Laidlaw, Joseph J. Crisco, and Cindy Grimm. Modeling and Visualization of Inter-Bone Distances in Joints. In Visualization '01 Work in Progress Proceedings, pages 24-25, October 2001. (pdf) (bibtex: Demiralp-2001-MVI). Russell E. Jacobs, David H. Laidlaw, G. Burns, R. Moats, and A. Toga. Multimodal Multidimensional Digital Develomental Atlas of Mouse Brain. In Winter Conference on Brain Research. Panel Session, January 2001. (bibtex: Jacobs-2001-MMD). David H. Laidlaw, Kurt Fleischer, and Alan Barr. Partial-Volume Bayesian Classification with Voxel Histograms. In Handbook of Medical Image Processing, pages 195-211. Academic Press, 2001. (pdf) (bibtex: Laidlaw-2001-PVB). Song Zhang, Cagatay Demiralp, Marco DaSilva, Daniel Keefe, David H. Laidlaw, Benjamin D. Greenberg, Peter J. Basser, Carlo Pierpaoli, E.A. Chiocca, and T. S. Diesboeck. Toward Application of Virtual Reality to Visualization of DT-MRI Volumes. In Proceedings MICCAI, October 2001. (pdf) (bibtex: Zhang-2001-TAV). Marco DaSilva, David H. Laidlaw, and J. Michael Tyszka. Reducing Errors due to Partial-Volume Effects and Noise in Pressure Maps Calculated for MR Velocity Data. In Proc. 8th International Society for MR in Medicine, April 2000. (bibtex: DaSilva-2000-RED). Dena Eber and Rosalee Wolfe. Teaching Computer Graphics Visual Literacy to Art and Computer Science Students. Computer Graphics, pages 24-26, February 2000. (pdf) (bibtex: Eber-2000-TCG). J. Michael Tyszka, David H. Laidlaw, Joseph W. Asa, Jeffrey, and M. Silverman. Three-dimensional Time-resolved (4D) Relative Pressure Mapping using Magnetic Resonance Imaging. Journal of Magnetic Resonance Imaging, 12(2):321-329, August 2000. (pdf) (bibtex: Tyszka-2000-TTR). Song Zhang, Charles T. Curry, Daniel S. Morris, and David H. Laidlaw. Visualizing Diffusion Tensor MR Images Using Streamtubes and Streamsurfaces. Poster at Human Brain Project Annual Meeting, NIH, Bethesda, MD, May 2000. (bibtex: Zhang-2000-VDT). Song Zhang, Charles T. Curry, Daniel S. Morris, and David H. Laidlaw. Streamtubes and Streamsurfaces for Visualizing Diffusion Tensor MRI Volume Images. In Visualization '00 Work in Progress, October 2000. (pdf) (bibtex: Zhang-2000-SSV). Andries van Dam, Andrew Forsberg, David H. Laidlaw, Joseph LaViola, and Rosemary Michelle Simpson. Immersive VR for Scientific Visualization: A Progress Report. IEEE Computer Graphics and Applications, 20(6):26-52, November/December 2000. (pdf) (bibtex: vanDam-2000-IVR). Eric T. Ahrens, David H. Laidlaw, Carol Readhead, and Scott E. Fraser. Investigating White Matter Diffusion Anisotropy Using the Desmyelinating Shiverer Mutant Mouse. In Proc. 7th International Society for MR in Medicine, May 1999. (bibtex: Laidlaw-1999-IWM). Russell E. Jacobs, Eric T. Ahrens, Mary E Dickinson, and David H. Laidlaw. Towards a MicroMRI Atlas of Mouse Development. Computerized Medical Imaging and Graphics, 23(1):15-24, January-February 1999. (pdf) (bibtex: Jacobs-1999-TMA). David H. Laidlaw and J.Michael Tyszka. A Demonstration of Errors in Relative Pressure Calculations for MR Velocity Data. In Proc. 7th International Society for MR in Medicine, May 1999. (pdf) (bibtex: Laidlaw-1999-DER). David H. Laidlaw, Kristen L. Cook, and Yuri M. Goldfeld. Evaluating Effects of Diffusion Weighting Choice on Accuracy of Diffusion Tensor MRI of Fixed Mouse Spinal Cord. In Proc. 7th International Society for MR in Medicine, Poster Session, May 1999. (pdf) (bibtex: Laidlaw-1999-EED). David H. Laidlaw. Continuous Bayesian Tissue Classification for Visualization Techniques. In Data Visualization Techniques, pages 107-129. John Wiley and Sons Ltd, 1999. (pdf) (bibtex: Laidlaw-1999-CBT). Eric T. Ahrens, Scott E. Fraser, P. T. Narasimhan, Russell E. Jacobs, and David H. Laidlaw. Multi-valued MR Microscopy of the Embryonic Mouse Nervous System. In abstract and poster, ENC, 1998. (bibtex: Ahrens-1998-MVM). David H. Laidlaw. On the Optimality of Partial Volume Classification Methods: Voxel Histogram Classification vs. Eigenimage Filtering. IEEE Transactions on Medical Imaging, 17(6):1094-1096, December 1998. (pdf) (bibtex: Laidlaw-1998-OPV). David H. Laidlaw and J. Michael Tyszka. Evaluating Numerical Methods for Blood Pressure MRI. In Laverna Titus Young Investigators forum, May 1998. (bibtex: Laidlaw-1998-ENM). David H. Laidlaw, Eric T. Ahrens, Matthew J. Avalos, Mark D. Montague, Alan H. Barr, Russell E. Jacobs, and Scott E. Fraser. Goal-directed Optimization of Magnetic Resonance Imaging. In Neuroscience Abstracts, November 1998. (bibtex: Laidlaw-1998-GOM). David H. Laidlaw, Eric T. Ahrens, davidkremers, Matthew J. Avalos, Carol Readhead, and Russell E. Jacobs. Visualizing Diffusion Tensor Images of the Mouse Spinal Cord. In Proceedings of IEEE Visualization 1998, pages 127-134. IEEE Computer Society Press, October 1998. (pdf) (bibtex: Laidlaw-1998-VDT). Terence H. Williams M.D. Ph.D. D.Sc., Nedzad Gluhbegovic M.D. Ph.D., and Jean Y. Jew M.D. The Human Brain: Dissections of the Real Brain. Unpublished (pdf) (bibtex: Williams-1997-THB), 1997. Joseph L. Gabbard and Deborah Hix. A Taxonomy of Usability Characteristics in Virtual Environments. Technical report, Virginia Polytechnic Institute and State University, Blacksburg, Virginia, November 1997. (pdf) (bibtex: Gabbard-1997-TUC). Hiroshi Ishii and Brygg Ullmer. Tangible Bits: Towards Seamless Interfaces between People, Bits and Atoms. In Proceedings of CHI, pages 234-241, 1997. (pdf) (bibtex: Ishii-1997-TBT). David H. Laidlaw, Alan M. Barr, and Russell E. Jacobs. Goal-directed Magnetic Resonance Brain Micro-imaging. In Neuroinformatics: An Overview of the Human Brain Project, chapter 6, pages 125-202. Lawrence Erlbaum Assoc., 1997. (bibtex: Laidlaw-1997-GDM). Jerry W. Shan, David H. Laidlaw, Galen G. Gornowicz, Daniel B. Lang, and Paul E. Dimotakis. Three-Dimensional Space-Time Structure of Turbulent Jets. In Proc. DFD97 Meeting of the American Physical Society, November 1997. (bibtex: Shan-1997-TSS). J. Michael Tyszka, David H. Laidlaw, and J. M. Silverman. Relative Pressure Mapping using High-speed Three-dimensional Phase Contrast CINE MR Imaging. Radiology 205, Suppl. S, November 1997. (bibtex: Tyszka-1997-RPM). Brygg Ullmer and Hiroshi Ishii. The metaDESK: Models and Prototypes for Tangible User Interfaces. In Proceedings of UIST. ACM Press, October 1997. (pdf) (bibtex: Ulmer-1997-TMM). George W. Fitzmaurice, Hiroshi Ishii, and William Buxton. Bricks: Laying the Foundations for Graspable User Interfaces. In Proceedings of CHI. ACM Press, May 1995. (pdf) (bibtex: Fitzmaurice-1995-BLF). Pratik Ghosh, David H. Laidlaw, Kurt W. Fleischer, Alan Barr, and Russell E. Jacobs. Pure Phase-Encoded MRI and Classification of Solids. IEEE Transactions on Medical Imaging, 14(3):608-615, 1995. (pdf) (bibtex: Ghosh-1995-PPM). David H. Laidlaw. Bayesian Mixture Classification of MRI Data for Geometric Modeling and Visualization . In abstract and poster for International Workshop on Mixtures, September 1995. (bibtex: Laidlaw-1995-BMC). William H. Press. Modeling of Data. In Numerical Recipes in C. The Art of Scientific Computing, pages 657-706. Cambridge University Press, 1992. (bibtex: Press-1992-MOD). John Woodwark. How to Run a Paper Mill. Information Geometers Ltd., Winchester, UK, 1992. (pdf) (bibtex: Woodwark-1992-HRP). David B. Kirk, David H. Laidlaw, and Alan H. Barr. Registration and Computational Staining of Multiple MRI Data Sets. In Proceedings of AUSGRAPH 1990, September 1990. (bibtex: Kirk-1990-RCS). Huseyin Kocak and David H. Laidlaw. Computer Graphics and the Geometry of S3. The Mathematical Intelligencer, 9(1):8-10, 1987. (bibtex: Kocak-1987-CGG). Huseyin Kocak, Frederic Bisshopp, Thomas Banchoff, and David H. Laidlaw. Topology and Mechanics with Computer Graphics: Linear Hamiltonian Systems in Four Dimensions. Advances in Applied Mathematics, 7(3):282-308, 1986. (bibtex: Kocak-1986-TMC). Lawrence Bragg. The Art of Talking about Science. Science, 154(3757):1613-1616, December 1966. (pdf) (bibtex: Bragg-1966-ATS).